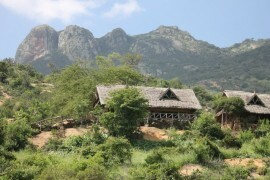 Kilaguni Serena Safari Lodge was the first lodge ever to be built in a Kenyan National Park, and is situated on the slopes of Mount Kilimanjaro, with the Chyulu Hills within vicinity and overlooking a water hole visited by large herds of elephant, buffalo and plains game in Tsavo West National park. 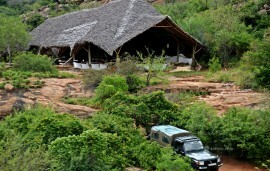 The lodge faces volcanic stone and features a thatched central dining area and a rock built bar. 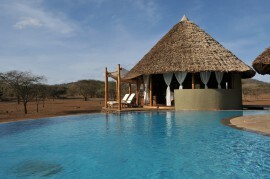 Kilaguni Serena Safari Lodge has elegant spacious stone walled en suite rooms. 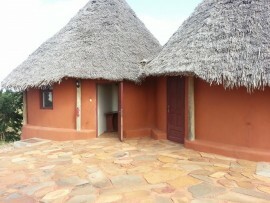 The rooms are air conditioned with ceiling fans, telephones, complimentary toiletries, Wi-Fi connectivity and private balconies that offer a scenic view of the water hole or the Chyulu Hills. The restaurant and bar/lounge are set up to overlook the hotel’s vast and beautiful landscape with the animals in their natural habitat as they wine and dine. Game drives, nature walks, bush dining and visits to the Rhino Sanctuary are some of the activities guests enjoy at their stay in the hotel. Kilaguni Serena Safari Lodge has up to par conference facilities with the conference room having a terrace that offers panoramic view of the Chyulu Hills and separate reception and registration area. There are grounds that delegates can use for team building or other social events. Conference facilities offered include PA system, LCD overhead projector, Wi-Fi, podium, flip charts and marker pens and full business support system.